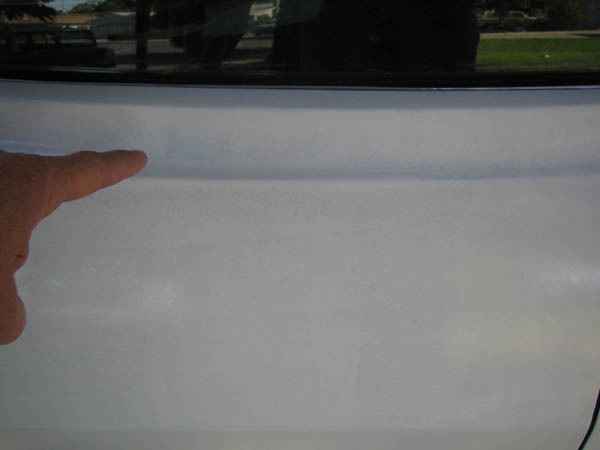 Since this car was painted, Oct. 2006, the "state of the art" in roller painting has moved on. Interlux Brightsides marine top paint seems to be the paint of choice. 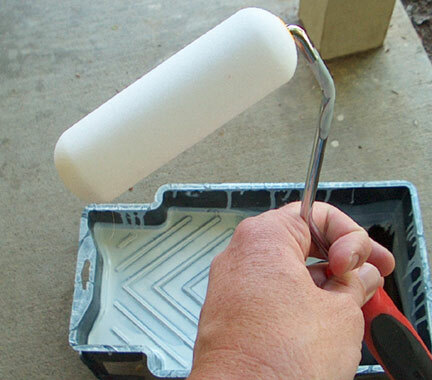 It is a single stage polyurethane paint with UV inhibitors and self leveling/flow additives. 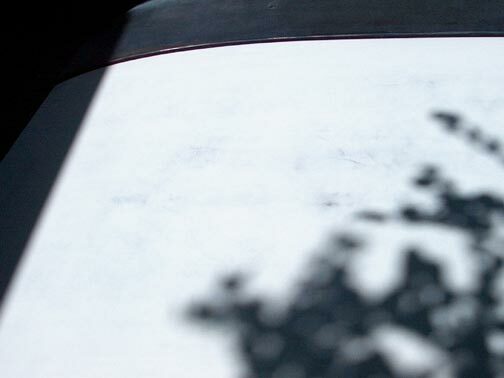 The moparts.org thread is now in three sections and a couple hundred pages long. About any questions I could possibly think of have been answered there already. 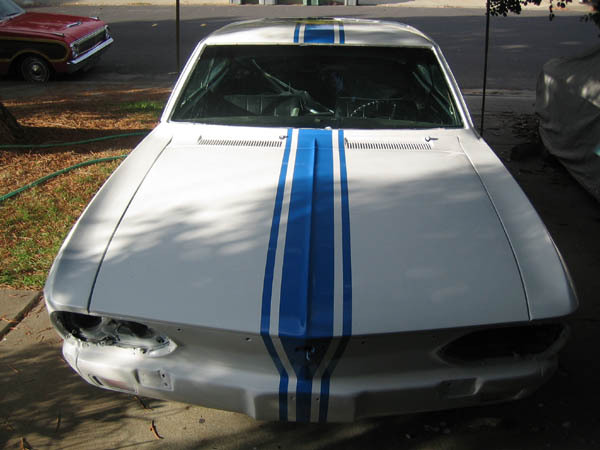 There is/was a widely read thread on the moparts forum about the "50 dollar paint job" . 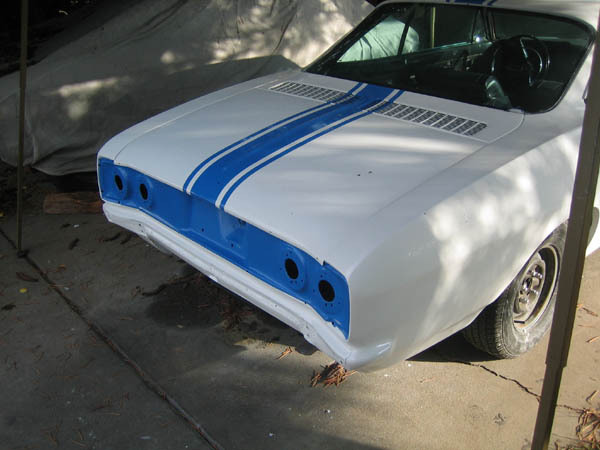 I figured since the Corvair is not in line to be professionally painted, I'd give it a try. Three quarts of Rustoleum gloss white. I thinned 50/50 with mineral spirits. The can says to use acetone, but the folks on the moparts forum had problems with the paint flashing too fast using it as a thinning medium. Mineral spirits seemed to work just fine for me and, when thinned, the paint self-leveled to completely smooth after a few minutes. Thin is the key. Thin. Not thick. Like milk. 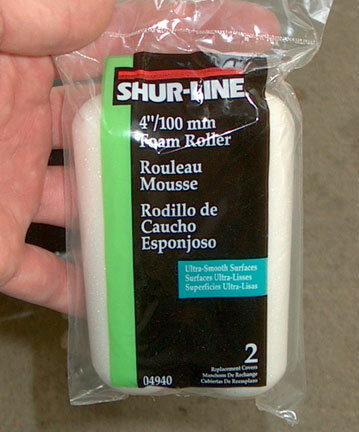 And keep the roller pretty dry, don't load it up. If your bubbles don't pop, it's too thick (or, you are pressing down way too hard on the roller). Un-thinned Rustoleum will take several months of hot dry weather to dry. You won't be able to sand it until it's dry. A 50/50 mix dries completely in 5-6 hours of warm weather. 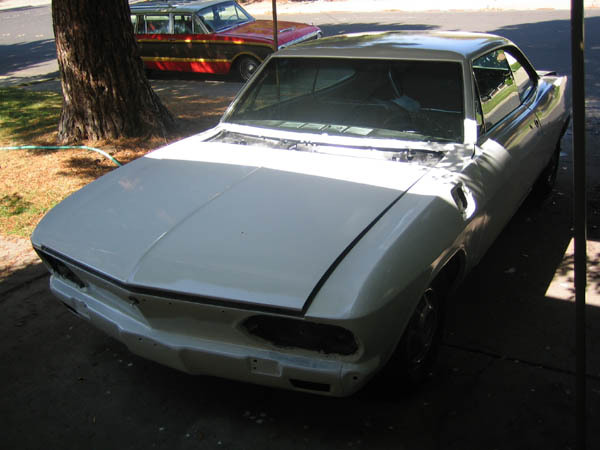 For more on the Corvair's body prep, go to: The Corvair bodywork page. A couple quarts of Rustoleum. A bunch of high density foam rollers. 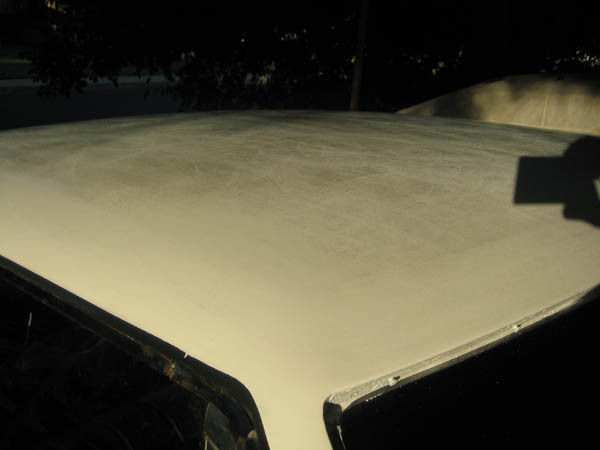 I tested a few (2) coats on the hood, and it looks like it will work well. 4-5 more coats to go, and lots of sanding. Polishing test with just two coats. Everything says go for it. 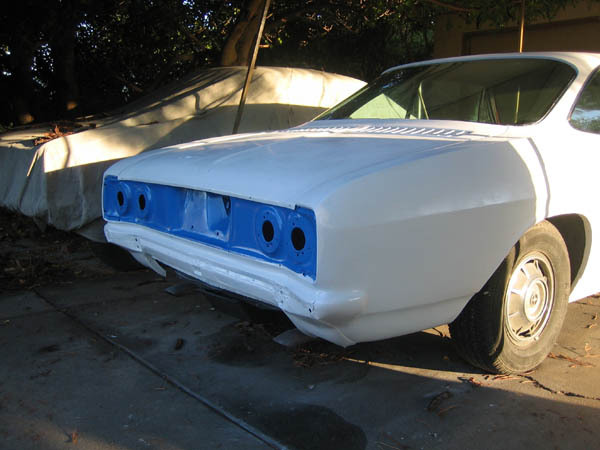 I rolled some white primer on first to fill scratches and stuff, but I didn't take any pictures. I sanded 90% of it off to get things smooth. 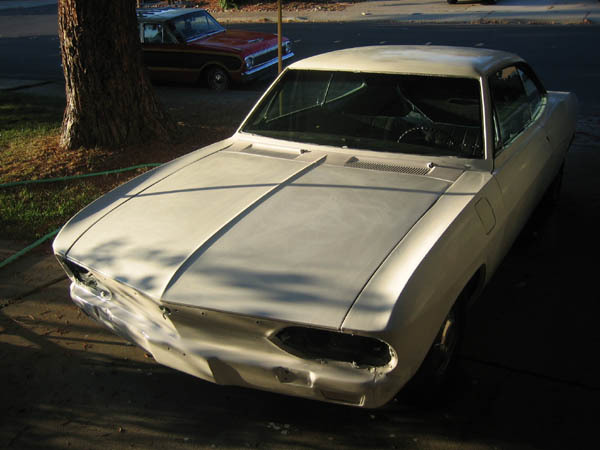 The white primer saved me a few coats, too, as I had full coverage after 5 coats. Four coats. It was warm the week I painted, so I was able to lay down two coats a day. 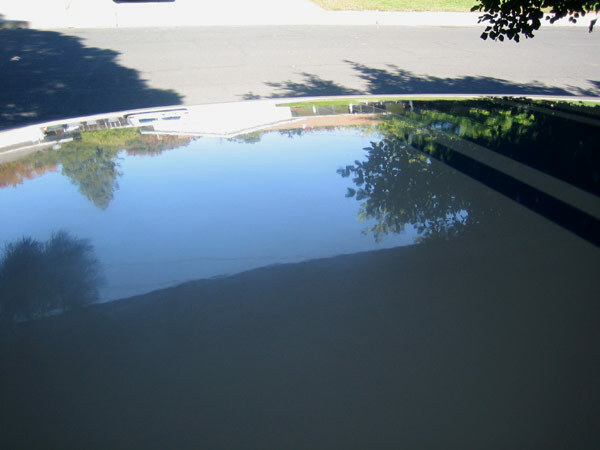 I'd get up in the morning and wet sand the car absolutely smooth, wash and dry it off completely, and then roll on a coat. The coat would be dry by late afternoon and then another coat would be rolled on. The first coat didn't cover much, and looked like hell, four coats was starting to look good. Four coats still has some spots that aren't completely covered. 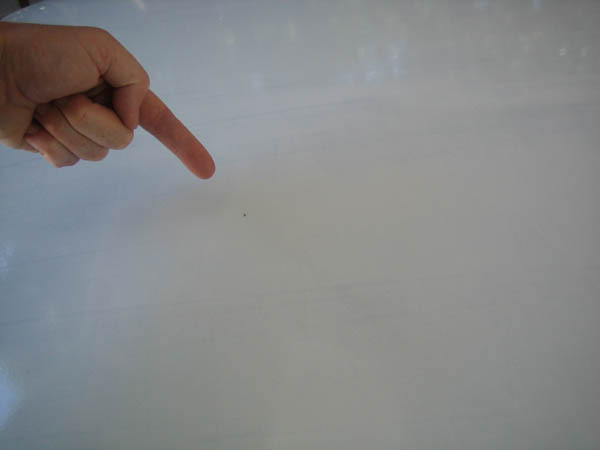 So there are some bug bits entombed in the paint. At first I was concerned about getting the bugs out, but it turns out they pretty much vanish during wet sanding. After six coats, wet sanded. I used 600 grit up to this point, taking out any residual orange peel bumps. 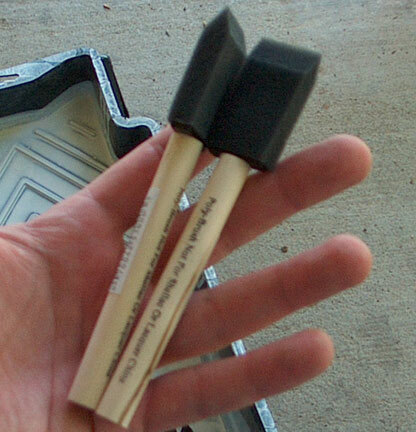 1500 grit on the last (7th) coat. Six coats was very complete coverage, with plenty of paint thickness to wet sand out any orange peel. Shot of the hood, sanded smooth. Other have reported applying 7, 8, sometimes 10 coats before complete coverage. I painted the cove the same color as the yet to be painted stripe. 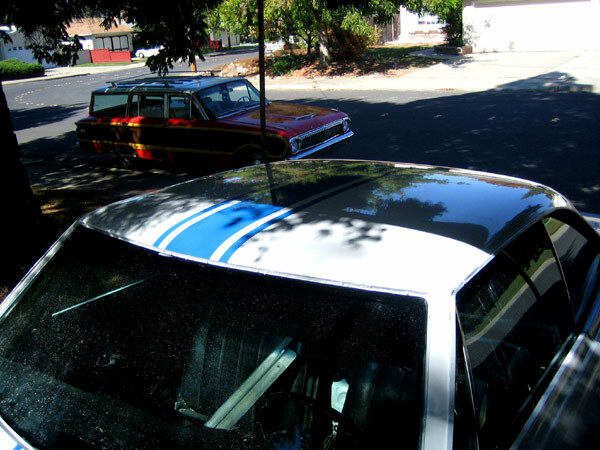 Yenko stripes went on after the seventh coat. 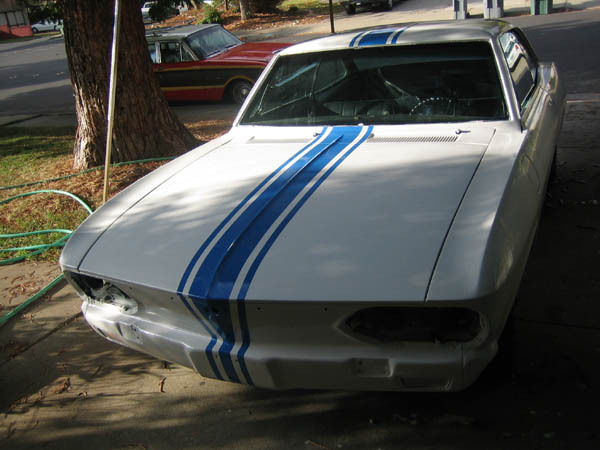 If anyone is wondering, Yenko Stinger stripes are 1" inch stripe, 1" inch space, 6" stripe, 1" space, and 1" stripe. 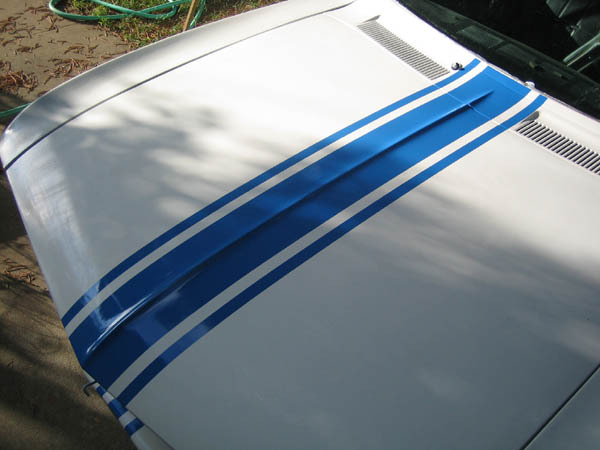 The front can either taper down to a narrower main stripe or stay a constant width down the front of the car. I picked the taper. 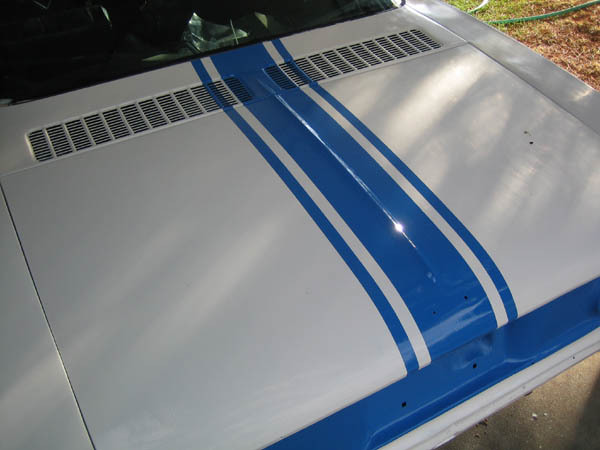 The stripes were rattlecanned, no way the thinned rolled on paint wouldn't have bled under the masking tape. To the right you can see some fresh bird poop. I let it sit for a week so all the paint could harden up, and then buffed the gloss back. 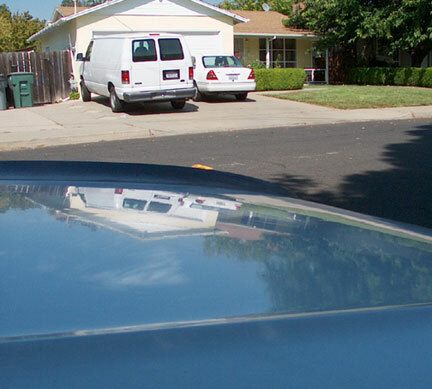 It buffed right up to a very glossy shine. 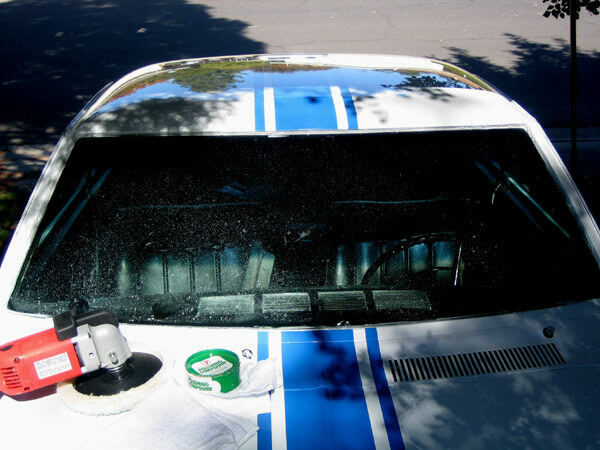 My cheapo polisher burned out about two minutes into the buff-out. So, I started to buff by hand, but, after an hour or so, I came to my senses and went down and bought a real buffer/polisher. It cost more than the entire paint project budget, but I can always use another tool. When using a spin polisher, I find it best to use masking tape on all the ridges of the body to avoid burning through the paint. The polisher throws polishing compound all over the place. I started putting the car back together after the polishing was done. After everything, I can say I'm -very- sold on the method of application. No booth, no paint gun/equipment, very little masking, no overspray. I do have unresolved questions about the paint. 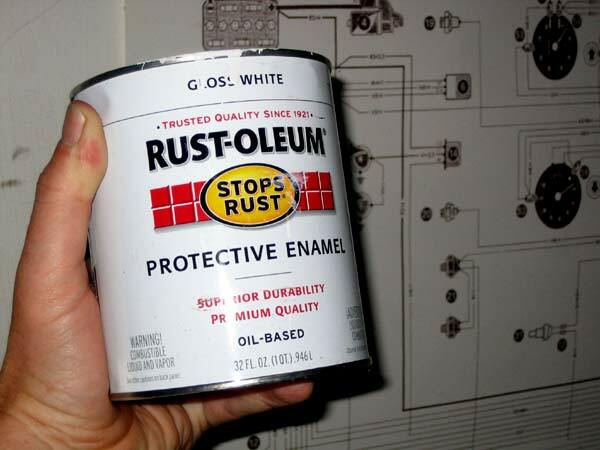 Rustoleum is a fine household enamel, but I wonder at it's long term durability. Several folks have reported eventual fading using Rustoleum colors. We'll see what happens with the white. 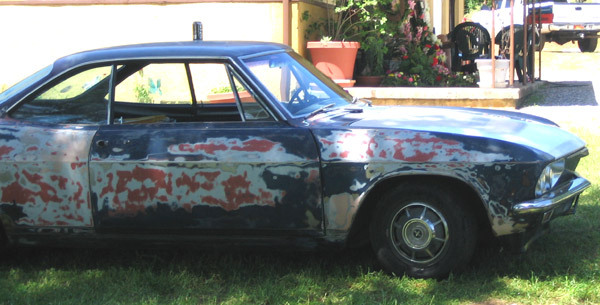 Next time I paint a car with this method, I'm going to investigate a few higher quality paint options. 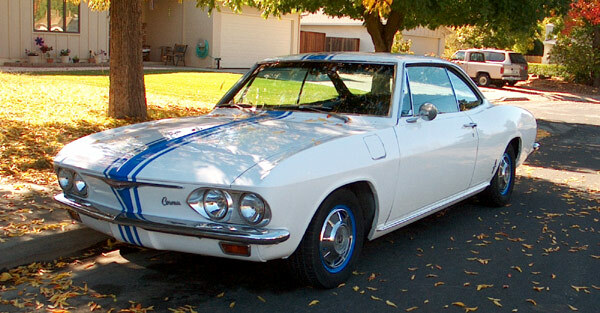 Corvair Corsa, mostly done, parked back on the street where it belongs. Rims rattle-canned to match the stripes, stock Corsa wheel covers. I still need to install the wheel well trim and "corsa" emblem that goes under the fuel door. 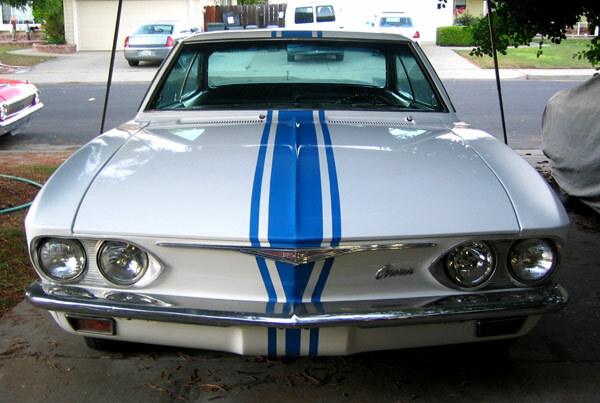 I can say, with confidence, the stripe is worth at least 5-7 rwhp.